Our Stage 3 Package for the 1996-99 E36 M3 takes our Stage 2 Package and adds the Schrick performance camshafts and matching Stage 3 Shark Injector software. The parts in Stage 3 are what led us to build Performance Stages in the first place. 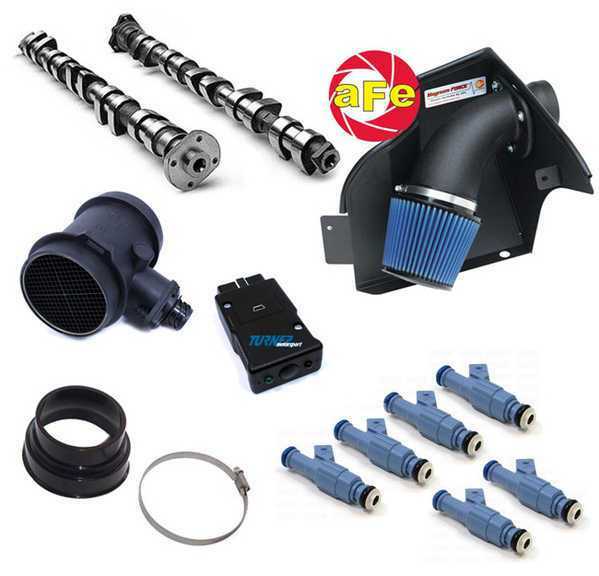 The parts in Stage 3 are our most-popular performance upgrades for the E36 M3: intake, cams, and software. While Stages 1 and 2 focus mostly on making mid-range power, Stage 3 shifts the focus on the top end of the RPM. With the more aggressive camshafts, we boost power over 5000 RPM in addition to more mid-range thrust. The aFe Euro intake is designed for a 3.5" HFM and includes a heat shield to block warm air from the engine compartment. The aFe intake uses an oiled cotton air filter for maximum air flow and excellent filtration. The kit is supplied complete with heat shield, intake tube, sealing materials, hardware, and install instructions. Just like in Stage 2, we use a Porsche HFM to work with the Siemens DME and special Turner Motorsport/Conforti software. This HFM reads airflow far more accurately than less-expensive other HFMs on the market. That extra metering allows us to fine-tune the software to make the engine more responsive, smoother, and produce more power! From Stage 2 we learned that the stock 3.2 fuel injectors were nearly maxed out so we specified "24lb" injectors for Stage 3. Stage 3 is designed for street cars that see a lot of runs to redline and the extra power over 5000 RPM is useable. We have matched the Schrick cams with the larger HFM and Stage 3 software to produce excellent top-end gains and an improvement in the low range while using the stock S52 intake manifold. We prefer the Schrick camshafts because they have been bulletproof through all of our testing and development. This is the best of both worlds - low/mid-RPM muscle with much-improved top-end. We also supply this Package as the Stage 3+ which uses the M50 intake manifold. This provides a lot of top-end power but the expense of low-end torque.